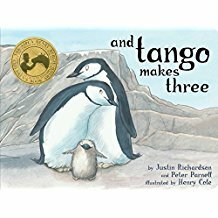 And Tango Makes Three is a 32 page picture book about two male penguins, Roy and Silo, that fall in love at the Central Park Zoo. The couple soon realize that they would like to start a family like the other penguins around them so, with the help of zookeeper Gramsay, they hatch an egg together. The result is a little girl penguin named Tango. The book shows that the family is like every other one at the zoo- living, playing, and sleeping together. The watercolor illustrations throughout the book are very detailed and the passages on each page are no more than a paragraph in length. I had initially read this picture book years ago when it first came out because there was such hype about it being banned in schools and libraries. Despite it being 12 years later, it is still a hot button issue with many individuals that this book depicts two gay penguins. I personally think that the book is adorable and simply represents a loving family. Not only is it depicting an "alternative" family, but it is also giving some information about chinstrap penguins and their mating rituals. The only thing I found disappointing was not with the book itself, but finding out that after it was written, the two penguins actually separated and found different partners. I personally have not read this book. I wonder if people would remember that we are talking about animals here if there would not be all of the 'banning' of the book hoopla? This sounds like a book I should put on my to read list. Mary, I definitely recommend putting it on your list. It's a picture book, so it's fairly short. I think because the animals are slightly anthropomorphized that it bothers people. I honestly think that homophobia is still rampant enough that is doesn't matter if they are penguins; people don't want children to be reading this material. Melissa thanks for sharing this book. I had not heard of it before but I am glad that it exists. Even though it contains controversial subject matter, I think it should be included in public libraries. The story does a great job of teaching tolerance and understanding. In addition, I contacted the zoo, it turns out the penguins reconciled their differences. They also keep in contact with Tango and are expecting to be grandparents soon.